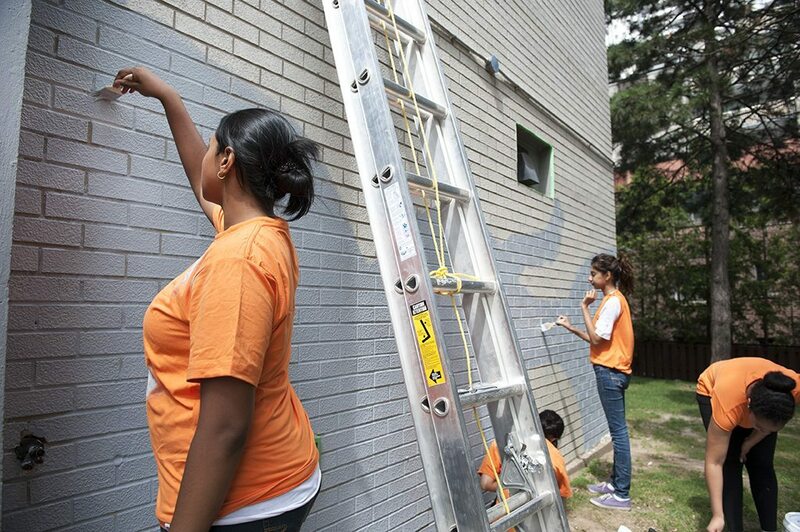 Top: young residents prepping the wall for painting. Bottom: lead artist Sean Martindale. Next time you’re walking that stretch of Wellesley between Sherbourne and Parliament, look up. Over the next several weeks, a grass-to-clouds mural will be painted on the south wall of 200 Wellesley Street East, a 30-storey St. James Town highrise that was last in the news when a six-alarm fire forced out over a thousand residents. The mural will depict an enormous phoenix flying toward the sky, representative of the new, more vibrant outlook the project hopes to bring to the building and surrounding area. It’s a symbolic choice rooted in the structure’s very real history. The mural—a rendering of which is along the right—marks the final stage of a year-long project in St. James Town by the STEPS Initiative, which brought together 40 St. James Town youth with eight artists to explore the community and explore how it could be changed by public art. 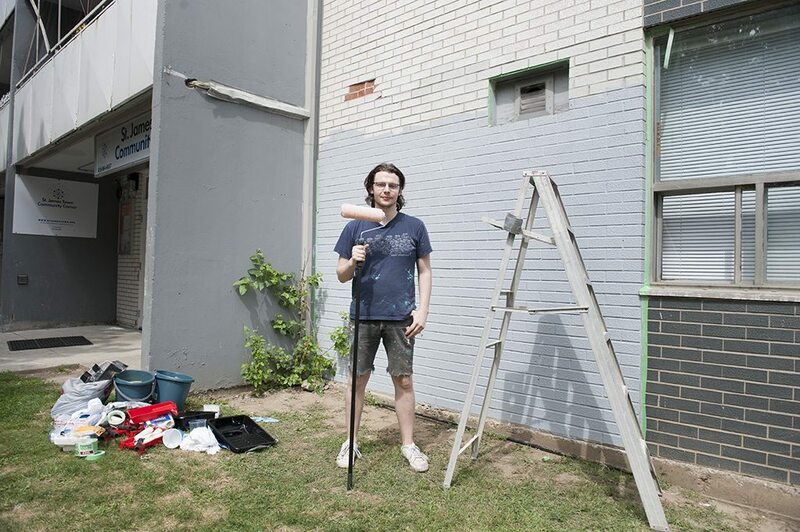 Many ideas were thrown around—gardening, putting things in the trees, affixing things to the building walls, constructing something three dimensional—before eventually settling on the mural and phoenix design after numerous consultations with St. James Town residents. The mural may not have been the most unusual idea under consideration, but the final result will be far from average—not only will it be the highest mural in the city, it might be the highest in the world. The plan is for the mural to be officially unveiled in September, with painting getting started on the upper levels a few weeks from now. Until then, residents and passersby can watch the project-in-progress with increasingly craned necks. And if Rahman gets her way, putting paint to brick will have the concrete result of drawing people to the site.